Join Andra, Tam & James. 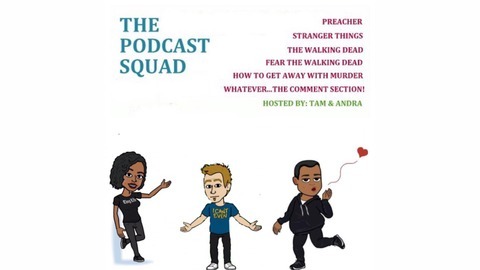 Three TV watchers giving 3 differents opinions for fun and exciting recaps on The Walking Dead, Preacher, Fear The Walking Dead, Preacher, Westworld, Stranger Things and other irrelevant topics! We don't always agree but we have fun anyway. 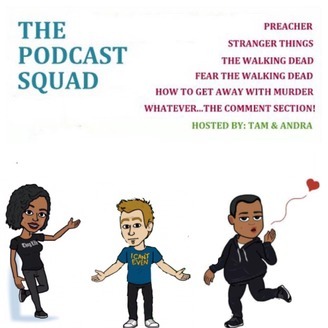 Join Tam and James for the podcast! Running low on fuel, June and Althea camp inside the SWAT truck over the next few days. They hear a static-filled transmission over the radio and go to higher ground for a better signal. Morgan, who is traveling with Sarah, Wendell and Jim, tries to make contact with the others by revealing his location via the walkie, but there is no response. Althea begins to feel weak due to lack of water and food. June and Althea find an abandoned truck and begin driving. They then see the SWAT truck drive past them, and they chase it. Althea comes down with a fever, and tells June there is antibiotics in her truck. June goes by herself to track down the truck, and retrieves it after an altercation with Quinn, the man who stole it. However, the truck is out of fuel. June cannot find the medicine, and Althea reveals over the radio that there wasn't any; she just wanted the truck back with her videotapes. June luckily finds medicine in an overturned bus near the truck. Morgan unknowingly encounters the mysterious woman at a supply box, and after he leaves, she replaces the bottles of clean water with dirty water. At higher ground, Morgan obtains a signal and gives his location. June and Althea hear the message and reunite with Morgan. Quinn, who has found fuel, is attacked and killed by Purvis, the Infected companion of the mysterious woman. She leaves Purvis behind and watches Quinn reanimate.